German forces entered Warsaw in September 1939. The next month, they ordered the establishment of a Jewish council (Judenrat) in the city. They chose Adam Czerniakow, a member of Warsaw's old Jewish Community Council, to lead it. 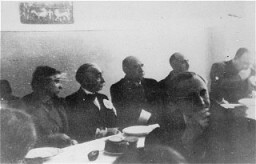 Here, for German newsreels, a German propaganda company stages a meeting between Czerniakow and petitioners from the ghetto. 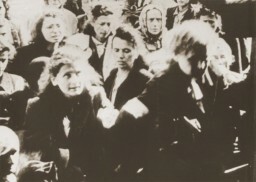 The Germans expected Czerniakow to implement German orders, including demands for forced labor and confiscations of Jewish-owned property. Czerniakow himself sought to ease the brutality of German measures, establishing food kitchens, workshops, and vocational schools. He constantly pleaded for better conditions. He committed suicide in July 1942 rather than comply with German demands that he help in the roundup of Jews destined for deportation.